If you’re like a lot of teenagers, you probably love playing video games. Maybe you’re a huge Halo fan, or perhaps you love Call of Duty. Whatever your game of choice is, there are things that you can learn about leadership from video games. Though I’m not a huge gamer, I do enjoy watching my sons play them. One thing I noticed about Mario Kart is the importance of making good small decisions. For example, you find yourself driving and notice that you are starting to head to the left on the road. So you make this major correction in hopes of getting back to the middle of the road. Usually this does no good and you end up driving off a cliff or into a lake or something that results in losing bunches of time. When you make way to big of corrections you end up losing the game. You soon learn that you need to make small corrections to win at Mario Kart. The same is true in life. Its making the small decisions/corrections in life that will steer the course of your life and cause you to not get off course. “Simply show up at your classes every day, and do the things your professors tell you to do, you’re going to beat 50% of people by just doing that. It’s such simple advice, but so true. Just showing up every day will make you a success at college. It’s the small decisions you make every day that will be the difference between success and failure in life. 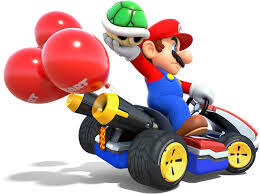 Just like in Mario Kart, the small decisions are the ones that will keep you on course for your life. Being a leader begins with the small decisions you choose to make every day. I encourage you to choose to make good small decisions which will make a huge impact on your life. Dear Lord, we pray today that we would make those small decision that will make us great people in Your eyes. In the Name of Jesus, Amen.